Play is fun! We all have happy memories of childhood play. What is your memory of playing as a child? Is it outside or inside? Is it alone or with others? Does it involve a favourite toy? Or is it around a favourite activity or past time? Who am I? Young babies are constantly discovering what they can or cannot do (yet), the new thing they want to do and discover how to do it. It changes all the time as they grow and develop. Who are you? Mum and Dad, the childminder, brothers and sisters, friends and playmates. They learn so much from imitating those close to them. They learn how to communicate, how to speak and relate to others. What is this? The environment is a source of wonder as they explore everything from gravity (by dropping things!) or the taste of everything they can get their hands on as babies. Children are hardwired to explore and learn by play. 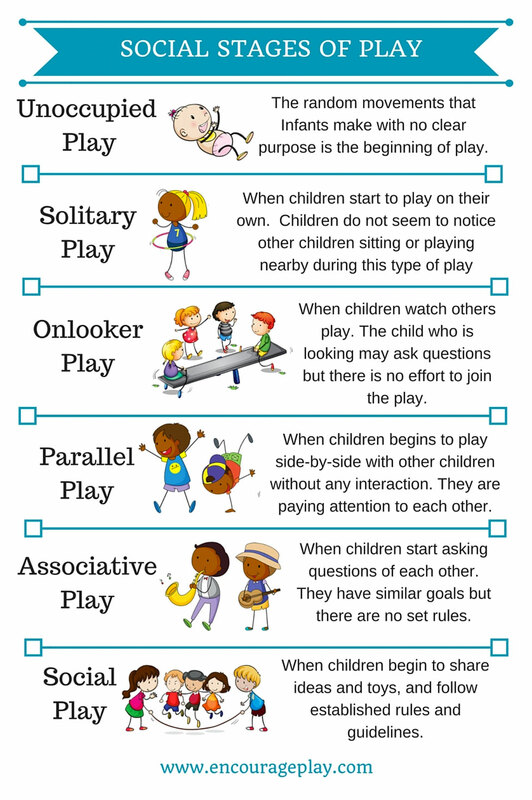 Follow the links to learn about different stages and types of play and what you can do to create a rich play environment. In the 1930’s, Mildred Parten observed that young children’s play developed in certain stage reflecting the child’s social development. She also found that once a child developed the ability to participate in a particular stage of social play, he/she would use different variations and combinations of that stage, and earlier stages, throughout play. From 0-5, play becomes progressively more complex as the child’ social skills develop. Unoccupied Play: At this stage, an infant is becoming familiar with his/her own body – that the thing with 5 fingers is their hand and they can control it! Children play alone, with objects and toys around them. This is important for building concentration and working independently. When a child watches other children playing but does not attempt to join in. This child is learning by observation. Children continue to play on their own, but they are beside children and may be using the same toys. They may be observing and imitating one another at the same time. Children truly begin to play with others. They share play materials but may be following their own story line. Children play in groups and everyone is cooperating to achieve a common goal. This involves negotiation, as they change “roles” in the play and/or take turns making suggestions about the plot.